As classic video games go, Pac-Man’s way up at the top of most lists. Even if it doesn’t have the seemingly endless amount of choices games like Skyrim or Fallout have to offer, it’s still a fun game to play nowadays. Sam McDougall has put together a pattern you can use to bring this classic from the screen to your clothing. 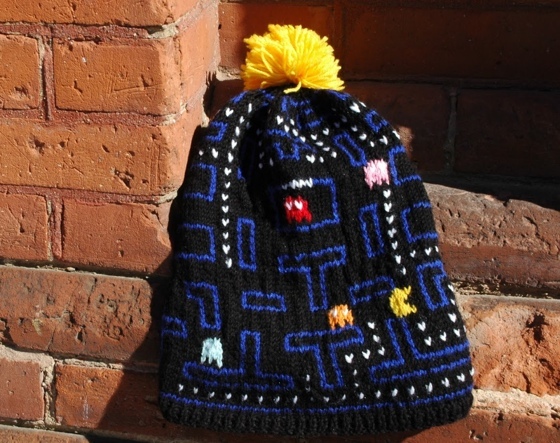 Now he doesn’t include the Pac Man Board Pattern in a specific pattern. Just the pattern for the board itself, so if you want to actually make something with this, you’ll either need to apply it to an existing pattern, or send Sam an email to bynxdesigns@gmail.com and ask him about the hat pattern he used to show this pattern off. With this chart, you can create many objects from throw pillows, to blankets, to a very slouchy hat! The Game Board chart is blank so that you may put the ‘pieces’ wherever you wish! Each ghost & gobbler are a 5×5 chart and fit anywhere on the board to make each project one of a kind!